I don't know about you but I have about a million series that I've started and have yet to finish. I got into this stage where I was waiting for series after series. I got sick of the waiting. The anticipation was killing me. So, I kind of made it a "thing" that I wait for the series to be finished before I'll read the entire thing. NO more waiting! Then I can goble the series up in its glory and gorge myself on the story. So, I'm waiting. Read the 1st book. Liked it just fine. Didn't bat an eyelash when the other books came out. Why? I have no idea? 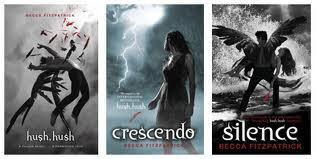 I'm not even positive but there might be a fourth book to this now too. Love the covers though. They don't really have anything to do with the story, but they are pretty. I read the 1st book and really liked it. A lot. I have absolutely NO idea why I've not read the other books. I mean, what's wrong with me?! 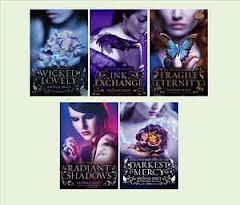 The covers are gorgeous too!! I'm going to have to sit down and read this one straight through! Is there a 4th book here? Is it called Finale? I actually own this series in Hardback as well as Paperback. I'd like to finish it but hate that waiting game. So, I'm just waiting. Then I'll enjoy! I've read them all except the last one. I really need to, I just haven't gotten around to it. My series looks incomplete on my shelf. Just knowing there is one last book. I love faeries. We'll see how it all ends. I can't even remember the story so much anymore. I waited until the last book was almost out before taking on Harry Potter! Glad I did! Here's my Top Ten Series I Haven't Finished. I hope you will stop by! I haven't even started any of these!! 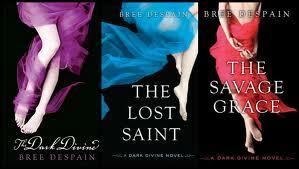 *eek* I'm realizing just how many series I HAVEN'T read today! Come see my Top Ten / Teaser Tuesday! I almost picked up Fallen yesterday. But when I thought about the huge stack of books I had at home, I passed. I do want to start that series sometime. I am guilty of gathering books in a series to wait for a massive marathon read. I wasn't a huge fan of Fallen or Hush, Hush and have never gone on with those series. Hope you like them though! I have been struggling with waiting for a series too. Here is what i have been doing the last few series. I read the first on and if I liked it I collect the rest of the series until they are all out. Then I start from the beginning. Also, I wanted to say thank you for your blog. I can totally trust your reviews and I have LOVED so many of the books you have recommended.